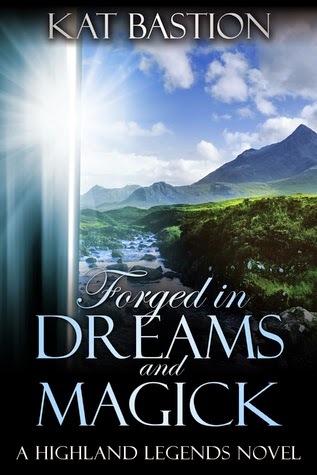 Short Review : Forged in Dreams and Magick will capture your imagination at the turn of every page. Must read for those who love fantasy and adventure. Full Review : Time travel novels are always a joyride. Especially when it is garnished with a lot of romance, emotions and adventure. Kat Bastion cooks up a perfect time travel book with “Forged in Dreams and Magick”. Its one hell of a novel and you get thrown to different times in the past without a moment to settle down..but still you will enjoy it..
It’s very difficult to merge history with fiction but Kat Bastion has done that seamlessly. The plot intrigued me at each step. Though a few more historical correlations would have definitely spiced it up even more. The author plays on the strings of philosophy with subtleness and never becomes preachy. The socieo-environmental conditions of the periods have been depicted with complete fidelity. The chapter I enjoyed reading the most is the one which involves the dreams (chapter-28)…its beautiful, its quirky, it’s funny..the writer paints with words..Sheer brilliance..from the title of the book I wondered why magick and dreams..Though all through it’s a dream like situation there were no dreams but this chapter adds a different dimension to this fantasy novel. Dream sequences are always difficult because one tends to go over the top. But this one sticks to the surreal zone and does justice to the rest of the book. Kudos! Time traveling is difficult. More so when you travel back and forth.. but the hardest path to tread would be when you are travelling in various time periods..to create three different periods and to do justice to each of them shows the writers command over the medium. The writer creates three different worlds with distinction but also takes care that travelling from one world to another doesn’t become a bumpy one. A very interesting scene is where she picks up the language of the Picts. The simplicity brings a smile on the face. The characters are lovable; their vulnerability brings them closer to reality. The author has beautifully interwoven various layers into all character be it Velloc or Iain to the lesser characters like Brodie, Gawain, Fingall, Robert, Duncan, Drust and others. Quite unlikely the supporting characters are not a burden. In fact characters like Brodie, Drust complement well to the protagonists and creates an interesting perspective. The supernatural elements are limited which again I think is very commendable. Though there were ample chances to add more supernatural elements but the author sticks to 3 and builds the plot on the characters and their intense and complex emotions. There is thin line of difference between sleaze and sensuousness. The author surely knows the line too well. The passion plays are raw, intense, spontaneous and honest. “The intriguing paradoxes of a man-hard edged but tender, accepting but inflexible, twenty-first century past and medieval reference-had me more than a little unsteady on my feet”. Something worth a mention is the writer’s choice of words and expressions. She has chosen her words wisely and nurtured each expression with a lot of care. This novel wouldn’t have been the same without them. I'm thrilled to be co-authoring with Stone Bastion, my husband, in a contemporary romance series!